A pea sized dollop is all it takes for styles that last all day! Our firm holding Balm keeps BARRETTES, BRAIDS, UPDO’S & SPIKY TEXTURAL STYLES IN PLACE. Replaces hairspray for non-toxic hold. Never crunchy or sticky…. always clean. Enjoy! Lice & Insects don’t like Organic Rosemary but We Love It! Our Natural Hair Balm is free of mineral oils, DEA, colours or dyes. Toss toxic hairspray away & enjoy worry-free firm hold. Organic extracts & nourishing emollients keep hair in place. Helps protect & strengthen all hair types’ including delicate flyaway’s & chemically treated, breakage-prone Sprouts. Keeps textured, spiky and hard to hold styles in place. Never crunchy or sticky. Insects don’t like Rosemary but we do! Aqua [Water with Organic Extracts of (Rosemary) Rosmarinus Officinalis, (Calendula) Officinalis Flower, (Cranberry) Vaccinium Macrocarpon, Arnica Montana Flower, Cucumis Sativus ( Cucumber) Fruit], Vegetable Glycerin, Punica Granatum (Pomegranate) Sterols, Butyrospermum Parkii (Shea) Butter, Theobroma Cacao (Cocoa) Seed Butter, Helianthus Annuus (Sunflower) Seed Oil, Prunus Armeniaca (Apricot) Kernel Oil, Prunus Amygdalus Dulcis (Sweet Almond) Oil, Peg-40 Hydrogenated (Castor Oil) Ethylhexyl Palmitate, Copernicia Cerifera (Carnauba) Wax, Glyceryl Stearate, Peg-100 Stearate, Butylene Glycol, Peg-75, Sodium Benzoate, Caprylohydroxamic Acid, Caprylyl Glycol. Amazing styling balm, I use this on my new hair which is growing back wonderfully but unruly from chemotherapy, I was looking for a safe styling cream that would not irritate my scalp or damage my new hair. This has been a blessing it styles my crazy hair that has a mind of its own at the moment but does not cause any stickiness or makes my hair look heavy or weighed down, it holds all day and has a subtle very nice smell. My nephew will use it every time he comes to visit and has asked if I can also buy him a pot so thumbs up from a 13 year old who spends a good hour before school perfecting his hair. 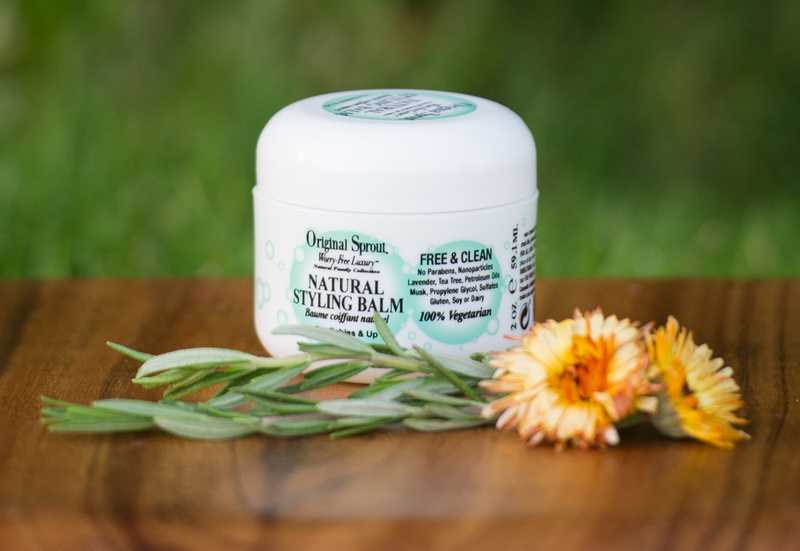 Original Sprout Products are Biodegradable, 100% Vegetarian (Vegan), Free of PhytoEstrogens, Soy, Parabens, Gluten, Dixoanes from Sulfates, Phthalates & Formaldehyde.